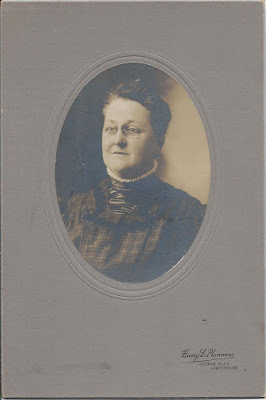 Early 20th century photograph of a woman identified on reverse as Emma Harlow Williams. The photograph was taken by the Harry L. Plummer studio of Lewiston, Maine. Emma Jerusha Harlow was born 17 September 1852 at Carver, Massachusetts, the daughter of Alvin Cobb Harlow and Rosette (Baird) Harlow. 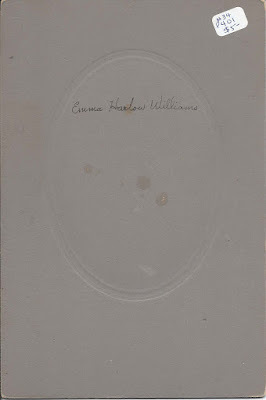 In March 1872 at Auburn, Maine, Emma married Charles Edward Williams, son of Barnard and Elizabeth Augusta (Herrick) Williams. Charles graduated from Farmington State Normal School, taught a few years, then pursued a medical education at Bowdoin College at Brunswick, Maine. He located his practice at Auburn, Maine. 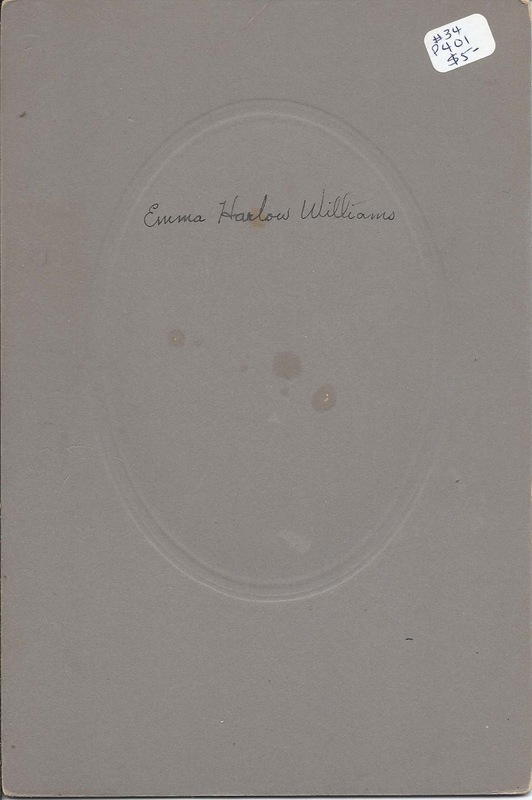 Emma Jerusha (Harlow) Williams died 9 October 1908. On 6 April 1911 at Auburn, Maine, Charles Edward Williams married Myrtle (Carroll) Pierce, daughter of George W. and Sarah (Gatlin) Carroll. If you have corrections to the information above or additional information on the Harlow and Williams families of Massachusetts and Maine, please leave a comment or contact me directly. Thanks!